Remediation in education is the age old process of meeting with students when they have been identified as at-risk or failing. Unfortunately, too often this occurs after students have failed a course, which is a disservice to our students and programs. Remediating after a failed course delays students’ matriculation through their program and causes a strain on faculty resources. This system can be improved through the simple use of student assessment data as a catalyst for implementing a process of proactive remediation. 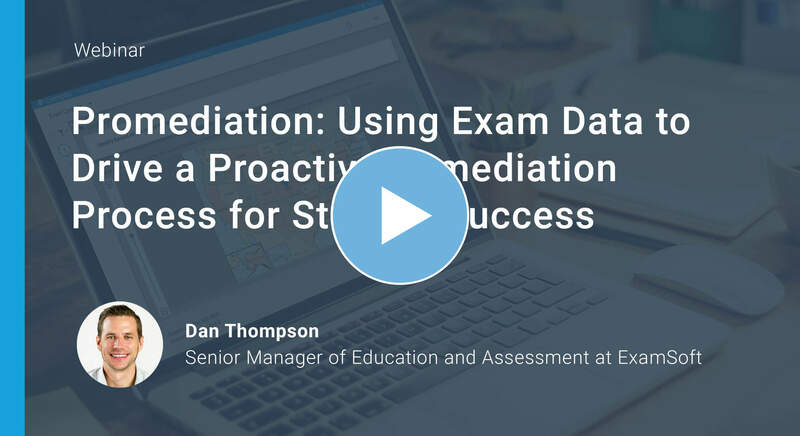 The presentation provides a blueprint for “Promediation” – the process of proactively remediating students throughout the course before students fail and/or fall behind. Implement use of formative assessments to identify and address areas in which students struggle before their first exam. Create a category mapping and feedback process at your institution that empowers students to self-assess their performance and devise a targeted study plan. Proactively remediate your students through the use of student assessment data to drive your teaching efforts.